If you are using MYOB to manage your business accounting, you can integrate Timely with your MYOB account. You'll need an MYOB AccountRight Live account to be able to use this integration. Note: It's not currently possible to connect an MYOB Essentials account to your Timely account. You will be redirected to MYOB to log in (use your normal MYOB details). Once you are redirected back to Timely, choose the Company file you wish to sync. Note you can only select this once so make sure you choose the correct file. Enter the username and password to access your MYOB company file (e.g. Administrator). Here you can select the Sales account for invoices, Default delivery status, Liability account for gift vouchers,Time of day to sync invoices as well as Choose the invoice number to use when syncing invoice. 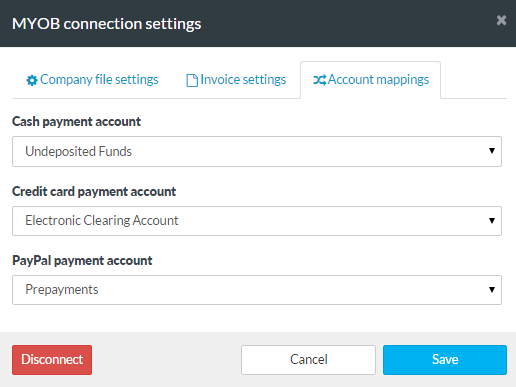 Then go to Account mappings and choose the accounts for your different payment types. Once the process is complete, your invoices will automatically be synced to the appropriate sales account(s) at the designated time. 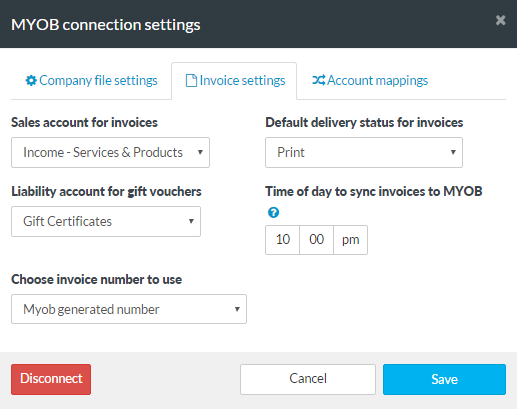 Any Notes you add to the invoice, will be added to the MYOB invoice as Comments and the Reference will be added to the Customer Purchase Order Number in Xero.